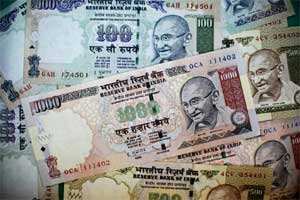 New Delhi: India crossed 66% of its full-year fiscal deficit target just five months into the financial year, reinforcing concerns about its ability to stick to the budgeted target for the year that ends in March. Finances are under strain mainly because of high fuel subsidy bill and the expected shortfall in government share sales target of Rs40,000 crore ($8.14 billion) this fiscal year. Slowing economic growth and rising interest in the face of high inflation also put pressure on the government’s finances. Net tax receipts were at Rs1.45 trillion and total expenditure was at Rs4.72 trillion. “It will not be a surprise if the fiscal deficit goes up a little bit to 4.8% of GDP (gross domestic product) this year as the actual growth will be much lower than earlier estimates," said N.R. Bhanumurthy, senior economist with National Institute of Public Finance and Policy, a Delhi based policy think tank. The government spooked investors on Thursday with its plan to borrow an additional Rs52,800 crore in the second half of the current fiscal year, significantly higher than expectations, to make up for a shortfall in a government scheme for small savers, sending bond yields and swap rates sharply higher. However, it said the new borrowing figure does not change its deficit target of 4.6% of GDP for this fiscal year ending in March 2012. Many analysts say India is on course to breach its fiscal deficit target. Standard Chartered expects India’s fiscal deficit to hit 5.4% of GDP for this fiscal year, it said in a note after Thursday’s borrowing announcement. “Till now, the government has not factored in any shortfall in revenues or increase in expenditure. Once these are accounted for, we expect a fiscal deficit for FY12 of 5.4% of GDP." Some analysts believe the government may be forced to borrow even more. “We expect a fiscal deficit for FY12 of 5.4% of GDP to translate into another Rs400-600 billion (Rs40,000-60,000) of market borrowing in the remainder of FY12," the Standard Chartered note added.